Looking at the graphic below, without knowing what it is, does it cause you any concern? What if I told you that the arrows into Hong Kong represent a majority of the world’s flow of money? Does it cause you concern now? Honestly, it doesn’t overly concern us because we hold money. But before you dismiss us as being pretentious, we simply mean that we own physical gold and gold mining shares. What concerns us is that some of you may not… read on. This week an article published by the Financial Times of London reported that this year’s UK gold exports to Switzerland have increased nearly 10 times when compared to the same period last year. Through the first six months of 2013, the UK has sent 798 tonnes of gold to Swiss refineries in comparison to 83 tonnes for the first six months of 2012. In the month of May alone, 240 tonnes were exported. 798 tonnes is a lot of gold! To put this figure in perspective, it is equivalent to almost 30% of global annual mined supply. By an alternative measure, this figure represents 8% of the estimated 10,000 tonnes of private and official gold rumored to be held in London vaults, which includes the Bank of England (BoE). Since this is such an extraordinary occurrence, it’s worth repeating … In the first 6 months of this year, London, the traditional center of the global gold market, has sent the equivalent of 30% of global annual mined supply to Switzerland. Since the UK does not mine any substantial amount of gold, and since the BoE only has about 300 tonnes held as monetary reserves on behalf of the British treasury, the exported gold must be coming from another source. In several of our recent weekly commentaries, we have suggested that one of the sources of gold feeding historical physical demand around the world is ETF inventories held in London. An attention grabbing 650 tonnes of ETF gold has been sold this year. We have also commented on the fact that according to information released by the BoE itself, a staggering amount of 1,300 tonnes has disappeared from their reporting between February and June of this year. This, of course, suggests the gold has left their vaults. When taken together, these three factoids provide strong evidence that an unprecedented volume of gold is on the move from London and now we know where a significant portion is headed. Most of these gold exports are being sent to Swiss refineries. Four of the world’s largest and most prestigious gold refiners, Metalor, Pamp, Argor-Heraeus, and Valcambi, are located there. Further, it is estimated that Swiss refineries process 70% of the world’s gold supply. There are also unconfirmed reports that these refineries are working around the clock at full capacity to handle the enormous gold flow. As you are likely aware, the “Swiss Made” brand is well known for quality and precision; spanning many products, industries and generations. Of course the Swiss also have a reputation for secure bank vaults and the efficient transportation of valuables that go in them. Due to the above traits, it’s no coincidence that the Swiss also have a long history with gold and the gold market. On this basis, there are three likely reasons why gold from UK vaults is being sent to Switzerland. The main reason is that Swiss refineries are the only ones in the world that have the capacity to transform the massive volume of standardized and globally recognized London Good Delivery 400-ounce bars into the smaller bullion products, such as the 1-kilo bar (32.15 ounces), that Asian buyers prefer. The last two reasons we and other market observers have commented on many times. First, there is unprecedented demand coming from Asia and buyers want the gold recast in a size, style and brand that is distinctly Asian. Second, gold owners are rapidly losing faith in the London gold market. There are widespread rumors, and a growing body of evidence, of impropriety in the London vaults. As a result, many wealthy individuals, institutions, and governments who have traditionally found it beneficial to maintain their gold holdings in the massive London gold market, are heading for the exits. They are transferring their gold holdings out of London and into private vaults that have no exposure to the paper gold financial system (i.e. ETF’s, the futures market, and bullion bank gold leasing operations). This is the same gold financial system where it is estimated that paper claims on gold ounces outnumber available physical ounces anywhere between 40 and 100, to 1. The dishoarding by ETF’s, discrepancies in the BoE books regarding their gold holdings, and now EU reported gold export volumes from the UK to Switzerland represent strong evidence that London gold is on the move. So Dude, Where’s All the Gold Going? Being curious gold market observers, we decided to do a little digging to find out where the Swiss refiners were sending this newly transformed gold supply. On a hunch, we analyzed the import data tracked by the Hong Kong Census & Statistics Department and found that 375 tonnes of gold has been imported from Switzerland over the first 6 months of this year. We also discovered that the UK has sent another 59 tonnes directly to Hong Kong over the same period. If we combine these two amounts, the total gold outflow arriving from the UK is 434 tonnes. 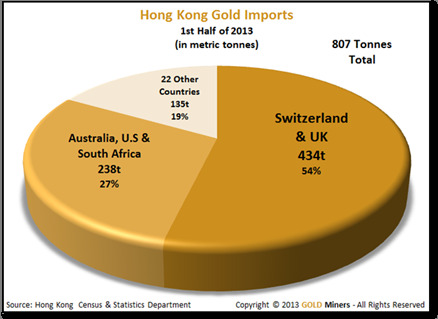 Intrigued, we kept digging and found that Hong Kong, again in the first 6 months of this year, has imported another 238 tonnes from 3 of the world’s largest gold producers, Australia (#2), the U.S. (#3), and South Africa (#5). These countries exported 81, 84, and 73 tonnes of gold to Hong Kong respectively. Let’s put this into perspective. If you were to annualize these figures and then compare them to each countries annual production, their combined exports to Hong Kong are equivalent to a whopping 73% of their cumulative annual production! Concluding our investigation, we found that 22 other countries have exported an aggregate 135 tonnes to Hong Kong. A tally of the above exports shows that a staggering 807 tonnes of gold has been imported into Hong Kong in the first 6 months of this year. This is an extraordinary number and when annualized, represents roughly 65% of global annual mine supply. Since a picture is worth a thousand words, we present a pie chart showing the breakdown of where Hong Kong gold imports came from during the first 6 months of the year and their respective percentages of the total. As you contemplate these figures, please don’t be alarmed by the loud sucking sound coming from the faraway East, as gold goes whooshing by overhead. China is the #1 gold producer in the world and keeps 100% of its annual estimated production of 400 tonnes. Therefore, the top 4 gold producing countries, on a combined basis, are sending a weighted average 83% of their annual production to China! 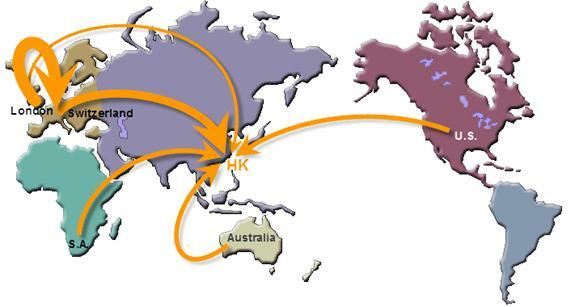 Here we must mention a quick note about imports and exports of gold between Hong Kong and the mainland. It’s easy to forget that, for all practical intents and purposes, Hong Kong is in China, and therefore Hong Kong is China. As the figures above demonstrate, the city of Hong Kong is also the gold gateway into the mainland. With this in mind, note that Hong Kong shipped 91%, or 736 tonnes, of its total gold exports for the first 6 months of the year, to the mainland. This lends fairly strong support to the whole Hong Kong is China theme. At the risk of confusing our readers, its important to note that the mainland shipped 218 tonnes in the other direction to Hong Kong. If you annualize this figure (e.g. 436 tonnes), it approximates the estimated annual mine production of China. However, since Hong Kong is sending 91% of every ounce that is imported (including what comes in from the mainland) to mainland China, it is very likely that this 218 tonnes is arriving for refining, vault storage, or a combination of both. This is because like Switzerland, Hong Kong has state of the art refining capacity and significant vault storage facilities. We have been fortunate this week to uncover a few more pieces of the gold demand puzzle. In previous Weeklies, we have established, along with many other astute market observers that physical gold is in strong demand. Further, a significant chunk of that demand is coming from Asia. In our above discussion, we have provided additional compelling evidence that physical gold is not simply changing ownership but is being physically shipped to China. In last week’s commentary, we wrote about tectonic shifts were taking place in the gold market and how they would render its landscape permanently altered. This week’s discussion provides powerful insight into a core aspect of this new gold market landscape. The new reality, which it would behoove gold market participants to wrap their collective heads around, is that China is the world’s biggest producer and consumer of gold. Therefore, they will be the primary movers and shakers in the gold market going forward. Highlighting this point, the Shanghai Gold Exchange has recently commented that its goal is to be the largest gold exchange in the world. Given the physical activity discussed above, this is not an idle boast. The mainstream press ignores or clouds the new realities unfolding in the gold market, but sober-minded investors can’t afford to. In our view, these gold market dynamics, along with others, can only lead to a favorable outcome for the gold price in the medium to long-term. Also, if the last month and a half is any indicator of what’s to come, gold is likely in for a strong 2nd half performance! Hope springs eternal. With this favorable gold price set-up, the shares of our beloved gold miners are poised to experience significant appreciation. Therefore, shrewd investors would be well advised to accumulate the shares of the stronger miners now. With that said, please find our Gold Miners Comparative Analysis Table below, which provides many important metrics critical to evaluating and comparing gold mining companies. Its purpose is to help discerning investors separate the wheat from the chaff. RJ Wilcox is a contributing editor to the Gold Miners Investment Newsletter, a monthly publication focused on mid to large-cap publicly traded gold mining companies. At Gold Miners, he is helping keep tabs on the passing parade in gold, gold markets, and the gold mining industry. HK is the world financial hub. Business news are highly connected and reported fast. You wuld think with that large amount of gold influx via HK, surely the mainstream media business news would pick it up but NO. This has been going for some time, I wonder what/who stops this news being reported.